Select the buttons below to view to the relevant section. 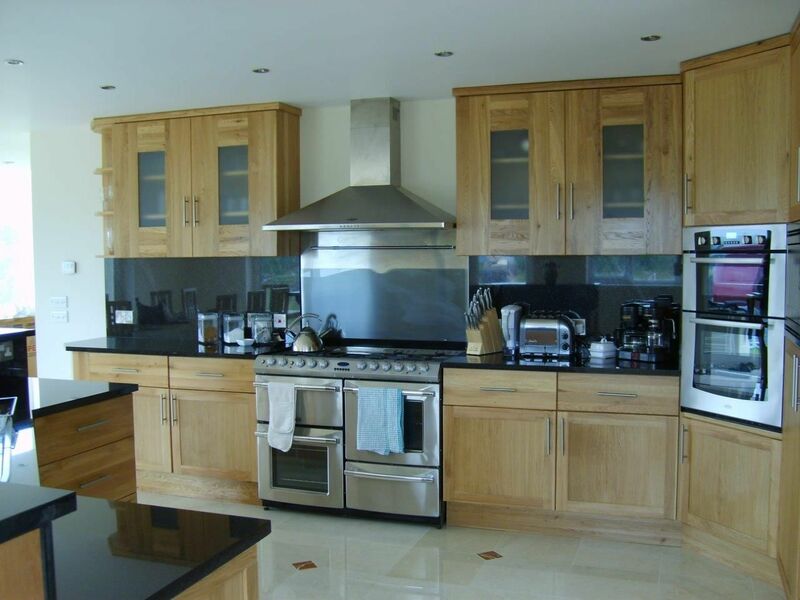 A traditional kitchen design with framed doors and drawers and a choice of shaker or panelled door design and plain or beaded drawers. Available in pine, painted pine and oak with a choice of worktops - solid wood, solid composite or formica. 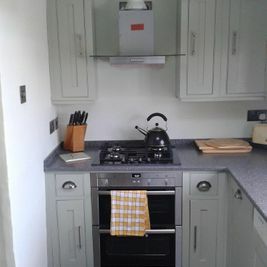 Sink, taps and appliances can also be supplied, together with a wide choice of knobs and handles. Softclose doors and drawers available. This Farmland kitchen features twin panel doors and beaded drawers painted in elephant’s breadth, beautifully complimented with a solid oak worktop. 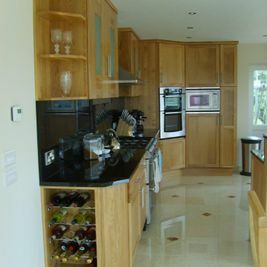 The island unit has been made and finished in the same style but with a solid composite top to act as a blended contrast to the rest of the kitchen. Painted in skylight this kitchen features a traditional Belfast sink and solid oak worktops. 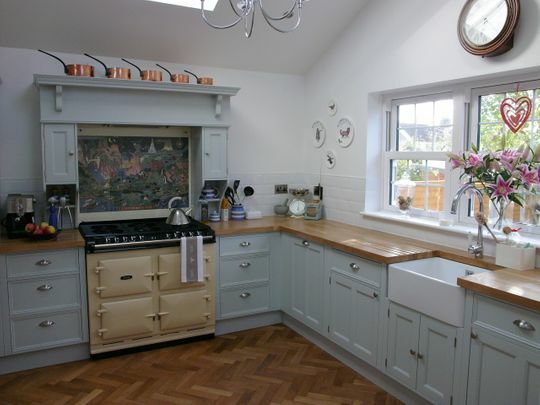 Around the aga is a large mantle, perfect for storage either side and an area to hide an extractor fan. 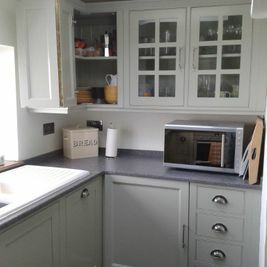 A Farmland design kitchen, but with shaker doors and drawers painted in skimming stone with pewter knobs. The worktops are slate and behind the aga is a custom sized glass splashback. This beautiful Farmland shaker kitchen has been painted in stunning cooking apple green with solid pewter door furniture and a polished granite worktop. 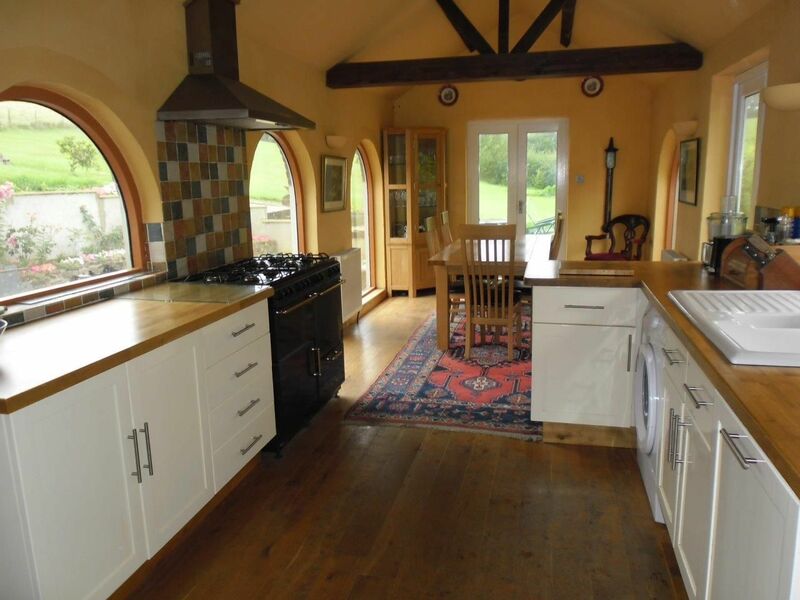 The large curved mantle over the aga beautifully sets off the old fireplace area. 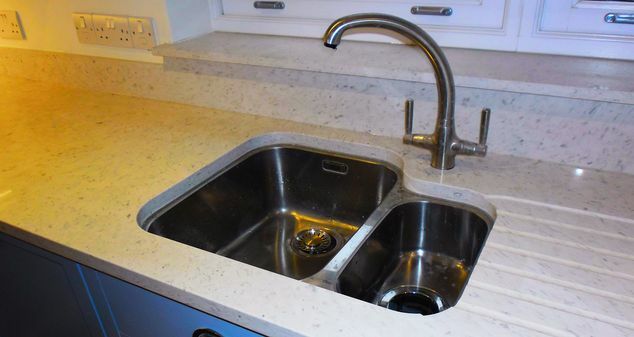 Double Belfast sink and custom built platerack above – a perfect combination of practicality and style. 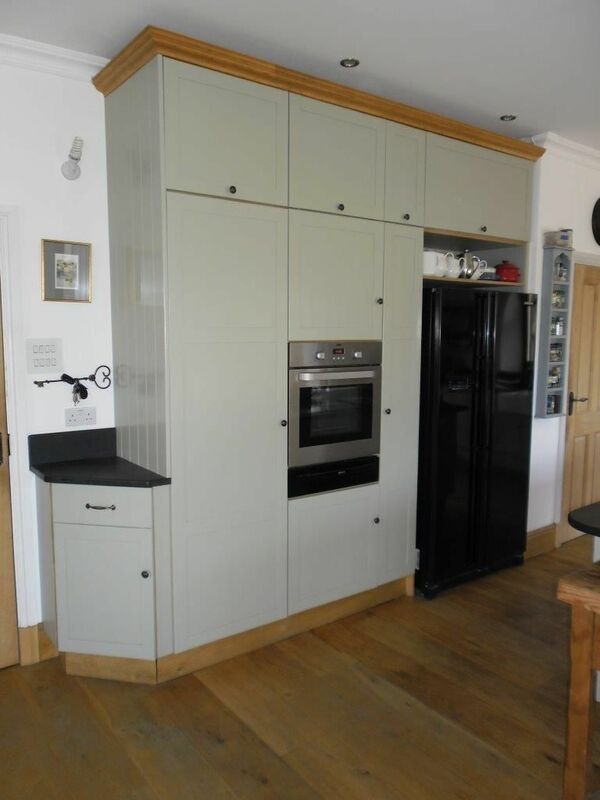 A classic kitchen design well suited for the modern or traditional home with framed doors and drawers featuring a subtle rebated design. Different door designs for Henley and Mayfair. 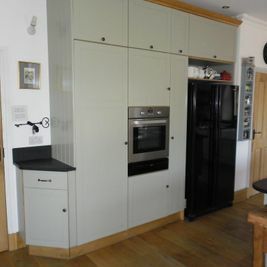 Available in pine and painted pine with a choice of worktops - solid wood, solid composite or formica. 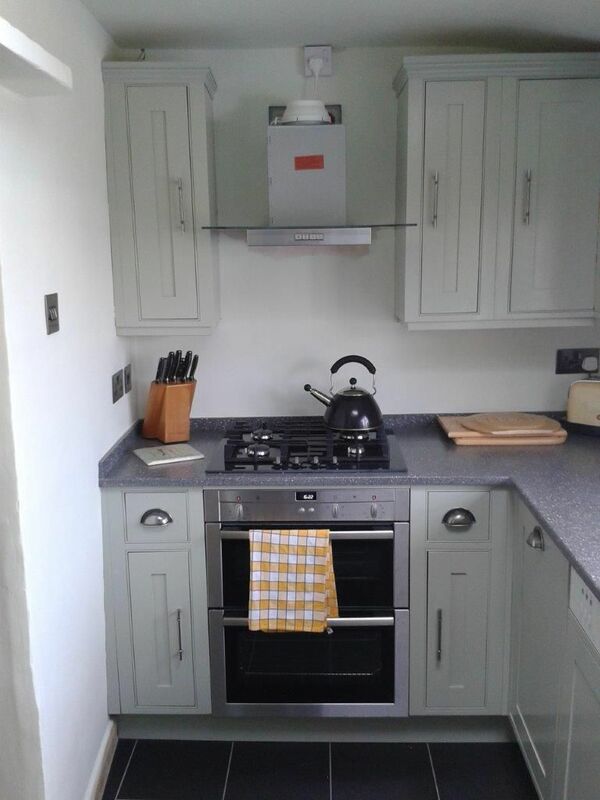 Sink, taps and appliances can also be supplied, together with a wide choice of knobs and handles. Softclose doors and drawers available. 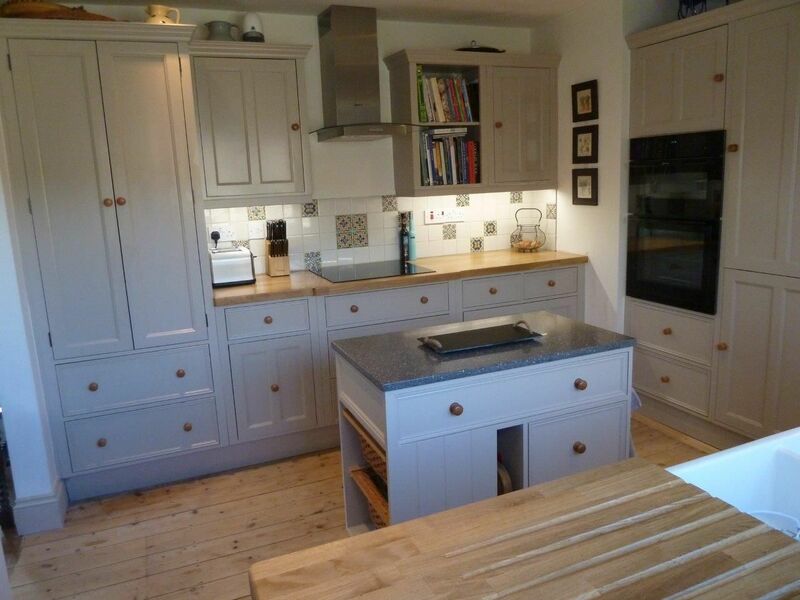 This kitchen was painted in ivory cream and featured the Mayfair detailing on the doors and drawers. The worktop was a composite top and had an undermounted sink. The oak lighting baffle matched the flooring perfectly. 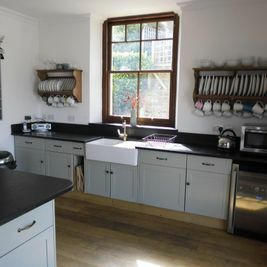 A small but perfectly formed kitchen featuring the Henley detailing on doors and drawers and making use of every cupboard and wall space to full advantage. 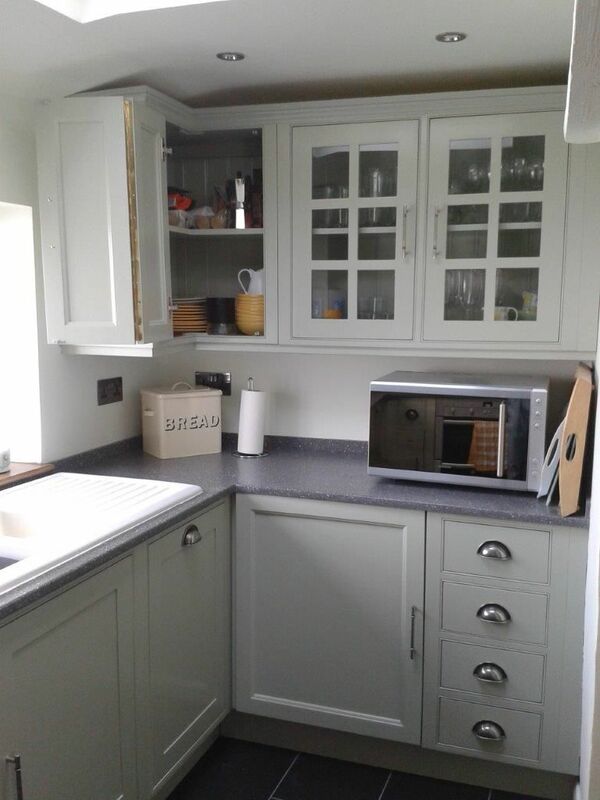 Painted in mizzle, this soft green blended so well with the darker solid composite worktops perfectly finished off with the solid pewter handles. 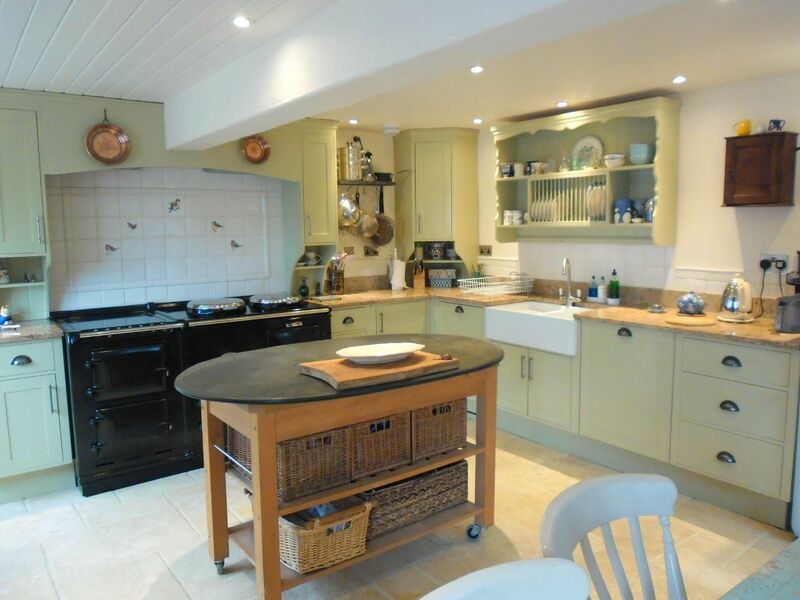 Painted in stunning pigeon this granite topped kitchen looks stunning. The island is both functional and compliments the room perfectly. 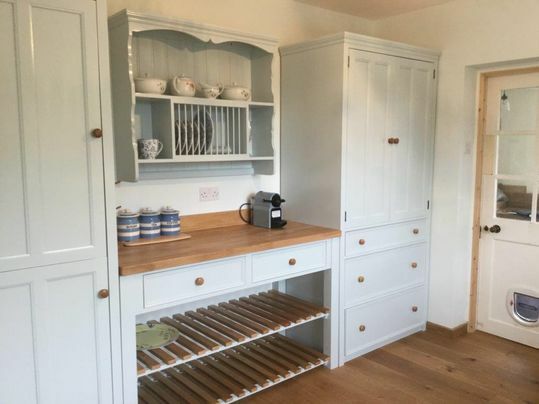 The large pantry cupboard features concertina doors and solid oak shelving inside. Shebbear Shaker design at its best. Painted in French grey with dark granite worktops and island top. 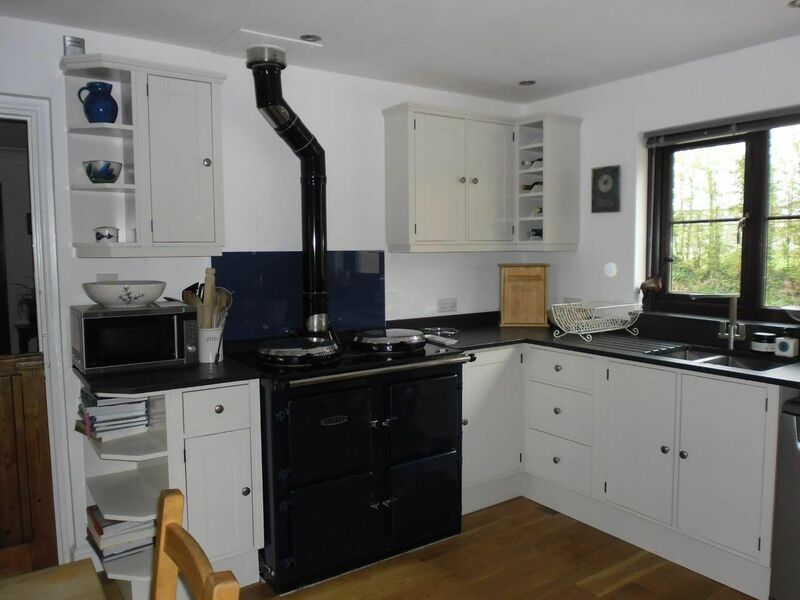 Shebbear shaker style kitchen painted in stiffkey blue with a solid composite worktop, finished off the stylish cup handles. 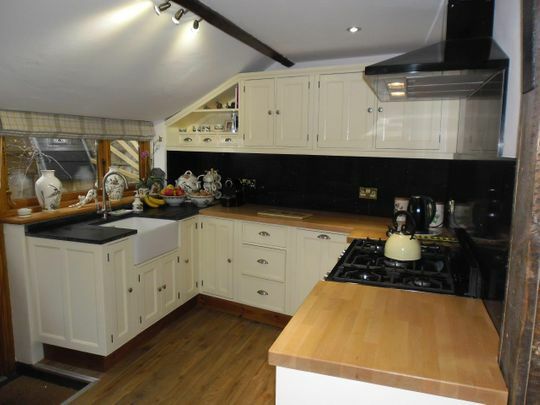 This kitchen was painted in ivory cream, with stainless steel bar handles. 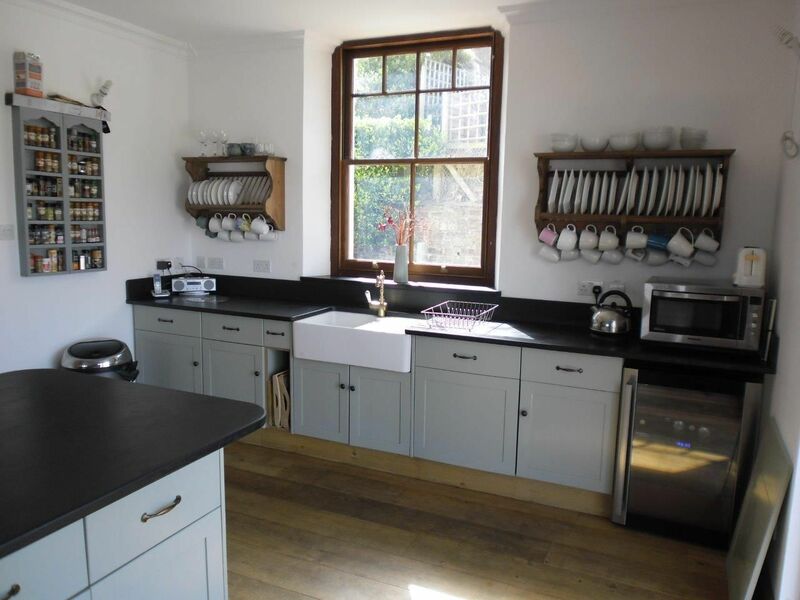 The oak worktop and kickboard blend perfectly with the flooring and other kitchen furniture. The ceramic sink with integral drainer is both practical and attractive for a busy family kitchen. 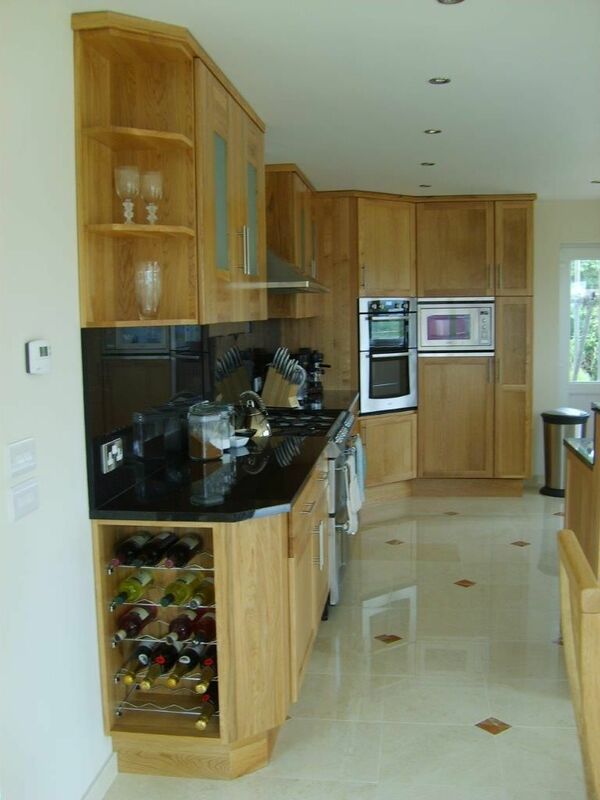 A solid oak kitchen featured drawer tidies, cutlery inserts and pull out linear metal baskets, together with integrated appliances all beautifully concealed behind doors. 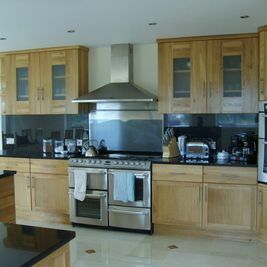 The worktop is polished granite. This freestanding kitchen was based on the Farmland detailing but each piece was individually made and was delivered ready to use. Freestanding shaker style units and oak worktops combined with a stylish yet functional butchers block. 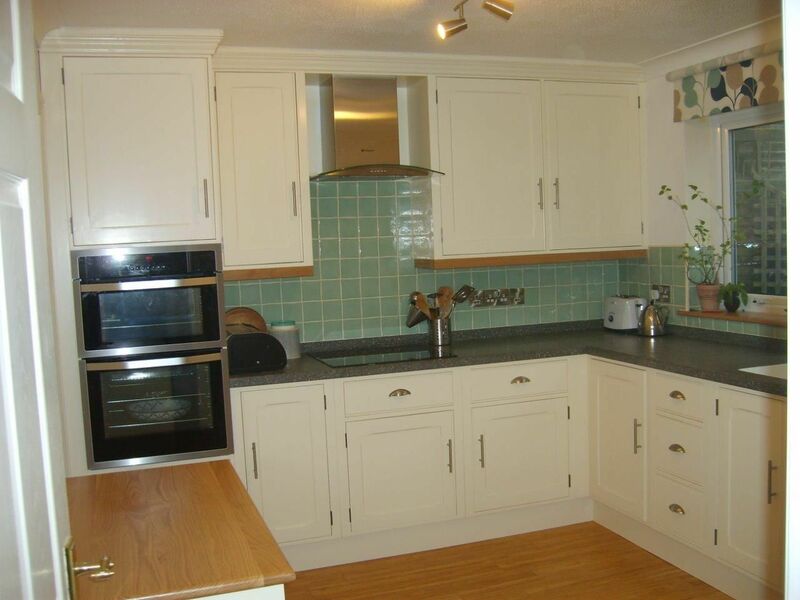 This customer so loved their kitchen when they moved house we made another one just the same for their new house. 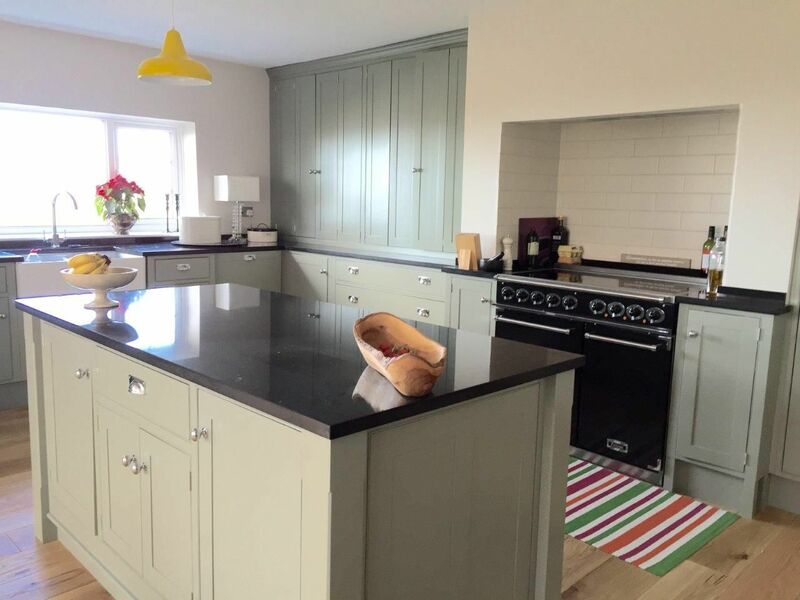 Painted in purbeck stone, this shaker style part freestanding kitchen looked stunning. 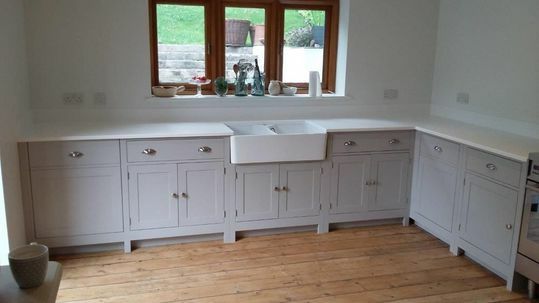 The solid composite white worktops with white ceramic belfast sink finished the kitchen to perfection.